Do you have a new dog, or maybe even a new car? Keep your backseats nice with a dog car seat cover! Most are made to be universal and cover your whole back seat, to protect it from hair and paw prints! We’ve put together a dog seat cover buying guide to help you choose one. First, let’s take a look at some of the things you need to know before you start shopping. Then, we’ll look at the products! Non-Slip: A great dog seat cover won’t move when your dog gets in and out of the car. Your dog also won’t slip off the seat when you have to stop the car. This is especially important for big dogs. Waterproof: Especially if your car has cloth seats, you’re going to want a cover that won’t get soaked. Also, you won’t want the residue from muddy paw prints soaking in, will you? A waterproof cover protects against that and more. Color: You might want a cover that comes in a variety of colors so your dog feels like a princess. Or, you might want something that’s going to match the interior of your car. It’s up to you! Machine Washable: After a few weeks or frequent car rides, you are going to want to clean your cover. It’s easy to just take it out of the car and toss it into the washing machine whenever you like. Size: You need your car seat cover to do just that – cover the seat of your car. This is helpful for determining if the cover is going to be too large or just right for your dog’s seat. Warranty: If there happens to be some part of your cover that is broken, doesn’t work right, or is otherwise unsatisfactory, you are covered under warranty. This is protection for you – and a refund or replacement due to manufacturing errors. Now that you know what you’d like, let’s look at our best dog car seat covers reviews! If you’re in a hurry, check out our top pick and budget pick first. They are the best of the best and will show you what to look for! But check out the rest of our list as well. You’re sure to find the dog seat cover that’s perfect for your car and your favorite furry family member! The Lantoo Dog Seat Cover is at the top of our list for how amazing it is! 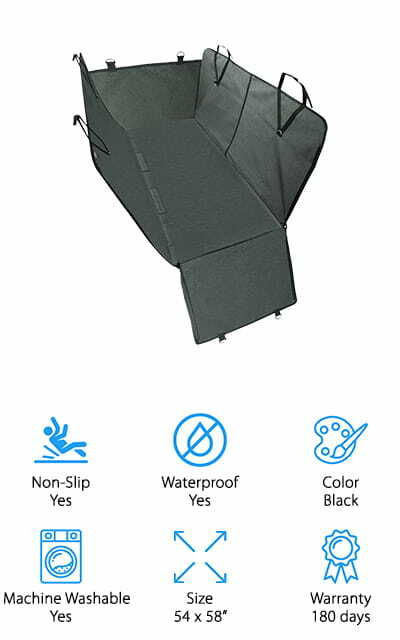 It’s got 3 layers of waterproof material, including a non-slip backing on the bottom and a cotton middle for both heat and comfort. 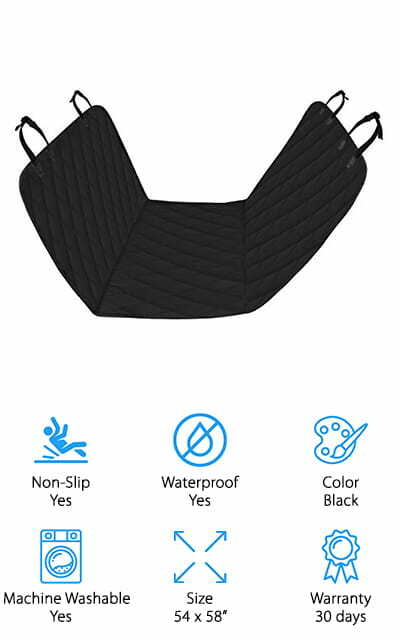 You want the non-slip backing so the cover doesn’t slide around when you’re driving, or worse, make your dog fall off if you have to brake a little harder than normal. It protects your back seats from claw marks, scratches, hair, and damage from water or muddy paws. 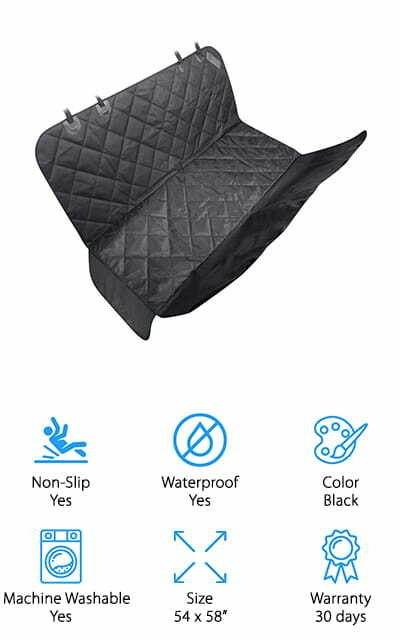 The surface is also non-slip and quilted for your pooch’s comfort. The cover anchors tight to the seat and has built-in Velcro openings for your seatbelts, in case you want to sit in the back as well. There are two extra side flaps for all of your dog’s toys and treats. It really is one of the best dog seat covers for sale! It fits most standard vehicles. This Upsimples Dog Seat Cover fits in the backseats of most cars, trucks, and SUVs. The side flaps cover the entire seat so nothing can get under it. It will fit over the sides so your dog won’t scratch the seat when jumping in or out. The headrest straps are enhanced and reinforced so the hammock position is ideal even for bigger dogs! It’s made of oxford cloth on the outside, with a waterproof PVC coating and an anti-slip backing. There are two pockets for all of the extra stuff you need for your dog. The best part about this cover is that it is made of one piece of fabric. 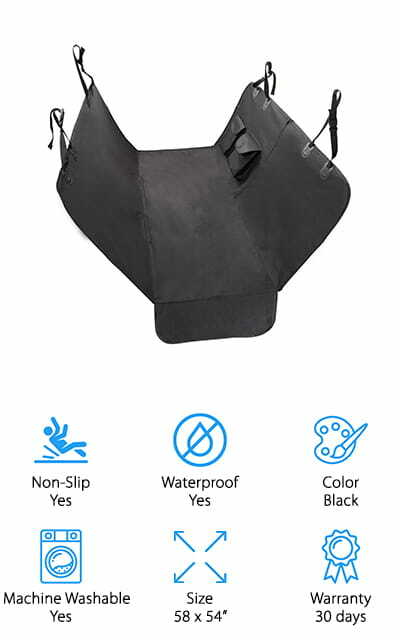 There are no seams, so it’s fully waterproof and won’t tear no matter how big your dog is or how hard they play. It even comes with a bonus dog seat belt! It’s one of the best cheap dog seat covers we saw during our research! URPOWER’s dog seat cover works great as a hammock, to comfort your dog and give them a cool place to hang out while you drive. It has side flaps to further protect your seat, and the zipper model is split so that you can only use half the cover if you need to. This enables kids or other people to ride in the back with the dog without having to sit on the cover. It’s one of the best dog seat covers for leather seats we looked at because it has Velcro seat belt openings that you can open and close for more protection. The quick release clips and buckle straps make installation easy – it straps right to the headrest. It will protect your seat from scratches or mud tracked in by your dog. It protects against wear and water damage. It cleans easily; you can wipe it down or toss it into the washing machine. The TaoTronics cover has gripping material on the bottom to keep the cover in place. Further, the loops on the side tuck down into the creases of the seat so that it definitely stays where you want it, no matter what size dog is going to be jumping in and out of it. There are 4 sets of plastic clips to attach it to the headrests. The fabric is made of textured, padded oxford fabric that provides an additional layer of waterproofing and reinforcement against scratches. There’s a soft cotton layer under the polyester top layer, which helps keep your dog comfortable and protect against all forms of moisture. It’s a great dog seat cover for trucks because it’s so big, as it comes in quite a bit bigger than some of the other covers on our list. It gives you resistance to dogs’ nails and paws, and it won’t stain! The hammock style feature looks really comfy! The SHINE HAI cover can be used for all sorts of pets, as well as dogs and cats. It’s also great for kids or toddlers! It can even be put under a car seat to keep your seats safe from any type of debris! The outer layer is 600D Oxford fabric that is waterproof and tears proof, so nothing will be able to get through this layer! In the middle is a cotton layer for comfort. It installs easily in minutes with quick buckles and removes just as quickly so you can clean it. It fits in most standard car backseats and has a rubber bottom so it stays in place and your dog stays where they need to be! 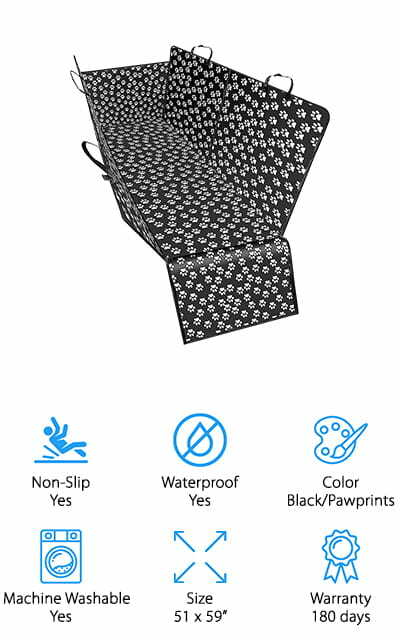 It’s thick, comfortable design and anti-slip features make it the best back seat cover for dogs as well as cats. This is pretty unique on our list for how many different things you can do with it. This pet seat cover is super plush and comfortable! It comes with heavy-duty buckles and zippers so they won’t break on you! 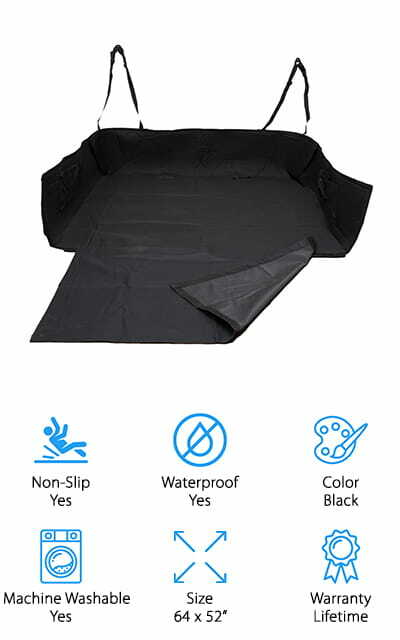 The high side flaps on this cover protect your car doors from damage while your dog is lounging in the backseat. It’s fully waterproof with nonslip backing and a neutral black color that will match almost any décor. Keep your pets comfortable and your seats clean! It is easy to install and can be washed by machine or wiped down with a damp towel to clean it off. 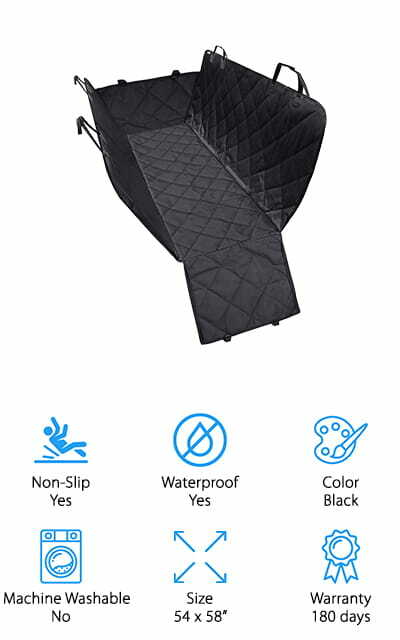 The stronger zippers are really nice features, as are the split-zipper hammock so that dogs and passengers can ride together in your back seat. It also keeps odors away! This would be a great jeep dog seat cover because of how sturdy it is. And it’s entirely risk-free to try because there’s a money back guarantee if you don’t like it! You can’t afford to try it. This Paws & Pals Pet Seat cover is pretty amazing. It’s made of three layers of material. The middle layer is waterproofing to keep all the wetness away from your seats. It protects against spills as well as odor and pet dander. The soft material backing prevents it from skidding when you have to stop or your dog moves it. The corners are elevated to help it stay in place. It covers the whole back seat, and you can even put it in the back of your minivan or SUV. It can drape over the bumper so it doesn’t get scratched when your pup jumps in or out. The versatility makes it one of the best dog car seats covers on our list. It’s one hundred percent waterproof and wider than most other covers on our list. It’s also made of amazingly durable canvas material that can be cleaned by wiping it down with a cloth! This cover from URPOWER completely encloses the backseat. 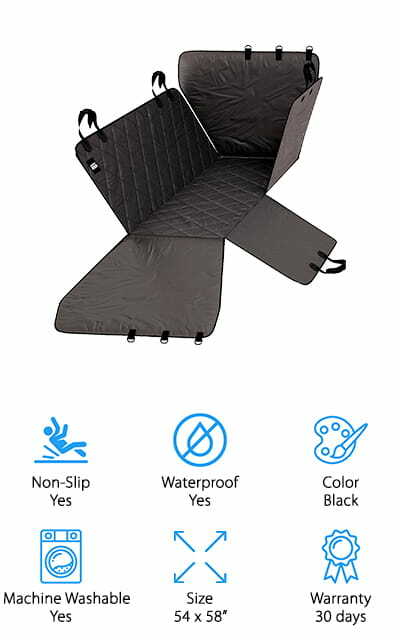 It’s a soft box that you fit inside your back seat, with side flaps that are secure enough to contain a new puppy. Keep yourself safe by keeping your super excitable dogs in the backseat. It also does a great job of keeping your seats and doors clean. It’s perfect for less disciplined dogs or dogs that are less used to riding in the car. It’s extremely easy to set up and anchors to loops in the seat. It should fit in most standard car seats. 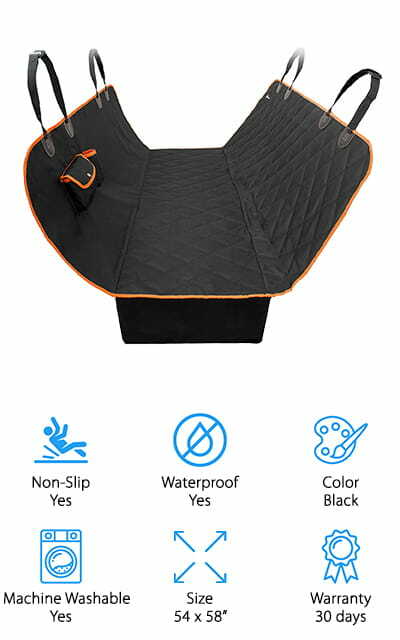 The hammock-style and completely enclosed design make it one of the best seat covers for dog hair that we looked at in our research. And the best part? It comes with a 30-day money back guarantee if it doesn’t fit in your car or isn’t right for you. It’s a no-risk purchase. Keep your back seat clean and free of hair with this cover! The MT-Great Cover has a universal design that can be used in nearly any type of car, truck, SUV, or van. You won’t have to detail your car after using this cover! You can attach it to the headrest of the front seat for a hammock, or use it as a stationary cover for the back by attaching it to your headrests the other way. It’s perfect for hauling dirty cargo as well as your pets. It’s sturdy and reliable! You won’t feel any anxiety about taking your dogs on trips with you now. It’s made of high-quality mounts and sturdy fabric, as well as waterproof coating. It is non-slip so it stays where you put it, and your dog stays where he needs to be. It comes with a nifty pouch to keep it stored in and a silicone dog bowl as a gift as well. We love that it can be used for your backseat and your trunk! The XUANRUS Oxford cover has a unique design on our list because the cover is black with white paw prints all over it! The flaps can be raised to make a box shape for cargo or over enthusiastic dogs. When they are down, the side flaps protect your car doors and seats. The split-zipper design allows you to use it as a full back seat cover, or only half to let the kids ride too. All surfaces are non-slip so it stays, and your dog won’t slide off when you hit the brake. It’s easy to install, and there are two pockets for dog stuff or other personal stuff that you want to take with you. The dimensions are even unique on our list, and allow it to fit a wider variety of cars. We just love the neat design! It’s waterproof, so you don’t have to sweep endlessly, or use a car vacuum every week to keep your seats clean.